Located in the heart of Palermo, Lo Scudiero is an oasis of calm in a city that can at times be overwhelming. I have been eating at Lo Scudiero for about as long as I can remember. This fabulous lunch brought back many memories. Proprietor Giuseppe di Maria continues the rich tradition of hospitality established by his father, Gaetano, who ran Lo Scudiero for many years. Visitors will find a menu that showcases local fish and seafood, along with a menu rich in the classics. The wine list is solid by Sicilian standards. Although it would be nice to see a more adventurous selection of artisan wines, I can also understand that local demand might not support an ambitious wine program. Lunch starts with a few Sicilian classics. Panelle (chick pea fritters) are a staple of Sicilian street food. It is unusual to see panelle served in a restaurant, but they are delicious and gone quickly. 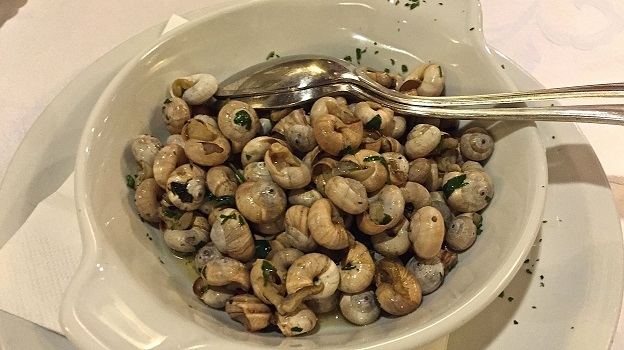 Several plates of Babbaluci, the small, baby snail that is traditionally served at the festival of Santa Rosalia that honors Palermo’s patron saint follow. We missed the festival, but not the snails. They are fabulous. Sadly, these staples of the local kitchen are starting to disappear as people lead busier lives and have less time to cook. What a joy it is to rediscover these very local, authentic flavors. 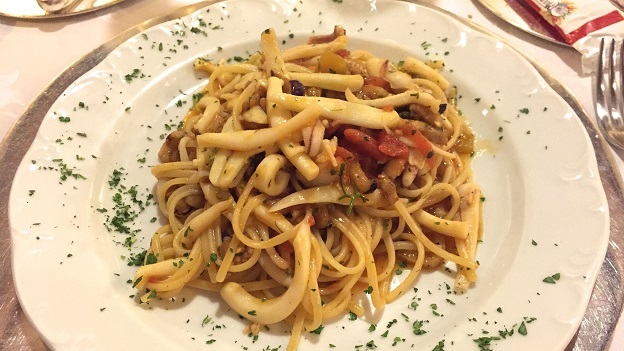 The Linguine alla Mediterranea is a welcome departure from the more classic fish and seafood pasta dishes that are often found on Sicilian menus. Rich, bold flavors abound, while the linguine is very much al dente. I confess I had a bite (maybe two) of my daughter’s Linguine alle Vongole, which was also delicious. I adore grilled red mullet, but it is hard to find, especially prepared well. 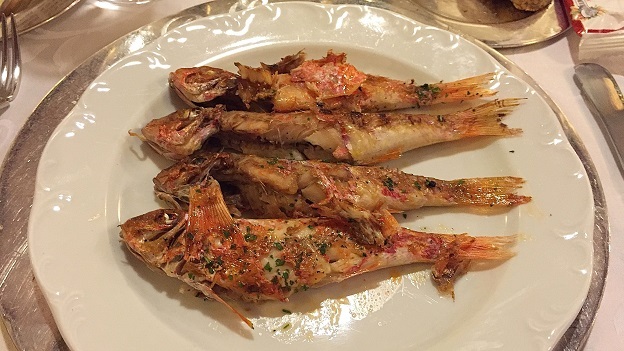 An intensely flavorful fish, red mullet has a lot of bones, but the end result is very much worth the effort. Passopisciaro’s 2013 Guardiola is 100% Chardonnay grown 1,000 meters above sea level on the slopes of the Etna. A rich, phenolic white, the Guardiola is intensely mineral, with real signatures of place but less in the way of varietal nuance. Still, the Guardiola is compelling and we go through two bottles pretty quickly. Feudo Montoni’s 2013 Grillo is a pretty, aromatic white, but it is a simpler wine and ideally should have been served before the Passopisciaro. On this scorching hot day, though, the wine’s freshness is quite welcome. Lo Scudiero’s dessert cart is full of classics that highlight Palermo’s rich tradition in pastry. The almond and pistachio cake is delicious, as is the tiramisù, which disappears in an instant, but the Cassata Siciliana is too sweet for my taste. Although off the beaten track, Palermo is one of Italy’s most fascinating cities in Italy, with layers of Norman, Arab and Spanish (among other) influences that are woven throughout its rich cultural fabric. The Teatro Massimo, Palazzo dei Normanni & Cappella Palatina, the Cathedral and a host of other sights are all worth a visit. Lo Scudiero is the perfect place to take a break from the pace of the city and enjoy a simple but well-prepared meal.